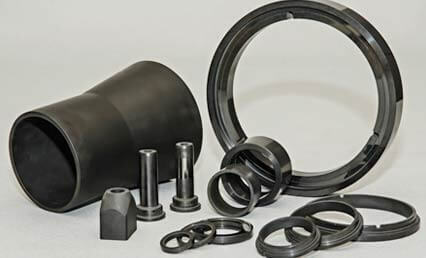 REFEL is an engineered reaction bonded silicon carbide ceramic with an extremely fine grain structure. This enables it to outperform other silicon ceramics as a hard wearing material and provides superior performance in arduous environments. The micro structure of REFEL gives a superb interlocking bonding strength and surface quality. When REFEL is used in mechanical seals, the seals have the lowest level of surface distortion which gives counter faces superior life. REFEL has a reputation for supreme performance and cost effectiveness. REFEL can be formed into complex shapes. Application fields include mechanical face seals, shaft seals, centrifuge and decanter flights. Custom designed linings have been made for equipment’s that transfer aggressive liquids and molten metal. REFEL is five times lighter than tungsten carbide, and is inert and strong. The thermal conductivity of REFEL is significantly higher than other silicon carbides. Applications for REFEL include the processing of titanium dioxide powder and the atomisation of non-ferrous molten metals (e.g. zinc). REFEL is available as rods, tubes, rings and complex 3D shapes according to customer specifications.